Villaraigosa Picks Up Councilmembers Price and Harris-Dawson Endorsement in Run for Governor; Villaraigosa continues to mobilize his home turf in statewide gubernatorial race. 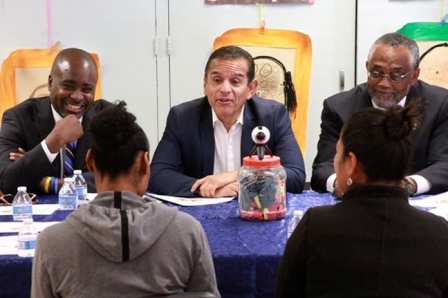 Former Mayor of Los Angeles, Antonio Villaraigosa kicked off his run for California Governor at Los Angeles Trade Tech last year with the support of Congresswoman Karen Bass. As he continues to travel up and down the California coast, Villaraigosa has picked up two more endorsements by City Council Members Curren D. Price Jr. (District 9) and Marqueece Harris-Dawson (District 8). The three leaders made it official at a visit and listening session at Holmes Early Education Center in South Los Angeles. The session included a visit of the facility where they heard from teachers, parents and administrators about the programs that put students on the path towards success. If elected governor, Villaraigosa shared that he plans to provide leadership that improves opportunity and equality for children in all communities, as well as for the professionals who educate Cali­fornia’s children. He plans to appoint a cabinet-level Early Childhood Education Coordinator to work across departments, connect with public and private sectors to identify best practices and work with stakeholders to develop improvements to our overall system of early childhood care and education, including improved training and compensation for workforce and better data collection to monitor our progress. The council members join with other Los Angeles leaders who have endorsed Villaraigosa for governor, including L.A. City Council President Herb Wesson, Congress­woman Karen Bass, Congress­woman Lucille Roybal-Allard, Los Angeles Supervisor Sheila Keuhl, State Senator Steven Bradford and former Los Angeles Supervisor Gloria Molina.